Faded Dreams is an all-day class on Saturday only. Your kit includes everything you need to finish the basket plus a dye packet. If you choose this class and can come back on Sunday morning, Annetta will show you how to do this special technique of dyeing your basket all at once. If you can’t come on Sunday, you will have everything you need and full instructions on how to do it at home. This basket is an explosion of color. There will be lot of discussion on dying reed – including space dying and over dyeing. Techniques in this basket include, twill weave, four rod locking row, twining, latticework and lots of shaping. Class kits will be available in ‘Shades of Purple’ and ‘Sunset Sky’. Students will over dye the completed basket – dye and dye bag provided. Please indicate color choice when registering for class. French Bread Basket is a great serving basket! The basket features a 2/1 double weaver twill, three rod wale, and X weaving, woven in gray and black reed and Hamburg cane. 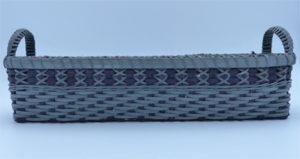 A decorative handle wrap done with gray Hamburg Cane. Seagrass Storage Basket from the Seagrass Laundry Collection, makes a sturdy storage basket. 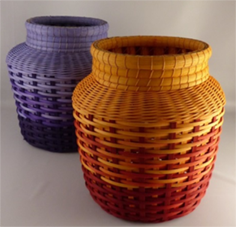 Dyed stakes, seagrass and leather handles give these useful baskets distinctive flair. Students may make either of the baskets. This special surprise will be announced during Saturday’s class. Annetta will have a bag of surprises with her and we are planning for an evening mini weave, plus pizza. Even if you can’t join us during the day for class, you are welcome to be part of this event. Evening Surprise class will be from 6 – 8 p.m. We will all split the cost of pizza. Class fee: $23-30, depending on your choice and fees will be collected at the time of class.